February 6, 2018, Oakland, Calif. – What do the human right to water, climate resilience, corporate sustainability, and energy costs have in common? Water. Global freshwater supply affects a broad range of issues, including public health, food crises, and environmental catastrophes. The much-anticipated ninth volume of The World’s Water Series explores some of the world’s most salient water issues, from challenges to the human right to water to the role of water in conflicts around the globe. Edited by Peter Gleick, president emeritus of the Pacific Institute and the world’s foremost expert on freshwater, the book shows how water touches everything, from civil conflicts to climate change and resilience. In this highly regarded series, Gleick and his Pacific Institute colleagues provide expert insights and solutions, key water data, and more. Gleick and his coauthors combine abundant data, insightful analysis, and the conviction that better education and awareness of water issues will lead to implementing smart and effective solutions. The World’s Water, Volume 9, like its predecessors, is an invaluable resource for community leaders, health officials, academics, students, and others whose work touches on freshwater. Pacific Institute President Emeritus Peter Gleick is the series creator and editor, with coauthors Michael Cohen, Heather Cooley, Kristina Donnelly, Julian Fulton, Mai-Lan Ha, Jason Morrison, Rapichan Phurisamban, Heather Rippman, and Stefanie Woodward. Peter H. Gleick is the co-founder and president emeritus of the Pacific Institute in Oakland, California, and is a recipient of the prestigious MacArthur Fellowship for his work on water issues. 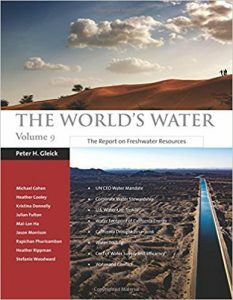 Read more about The World’s Water, Volume 9 and purchase a copy here.